This is the Perry Miniatures limber and 3-pounder. Perry make two sets, one for each side. 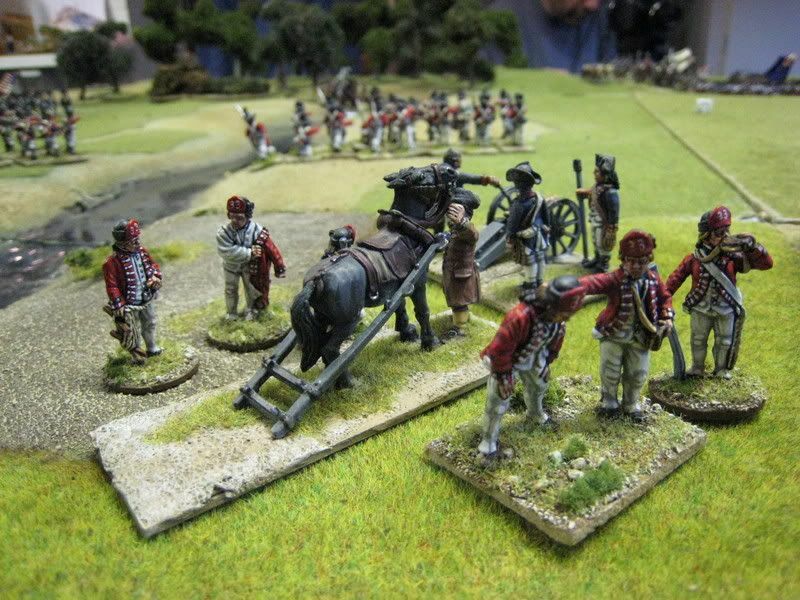 The cannon in the British pack is covered up with canvas and so can't be used on the tabletop for a gun in action; however there is nothing to prevent the American gun for being used on the ground. The only problem with doing so is that the limber itself is then suspended in thin air...... The two artillery men make quite nice "add-ons", one looking bored and the other looking annoyed at having to put his coat back on. This latter figure is the same sculpt as one of the figures in the British drag-rope pack, with a Continental head-swap. The hedges in the background are made by an Australian chap called Barry; I will feature his terrain pieces, including some astonishing grape-vines, in more detail in a future post. 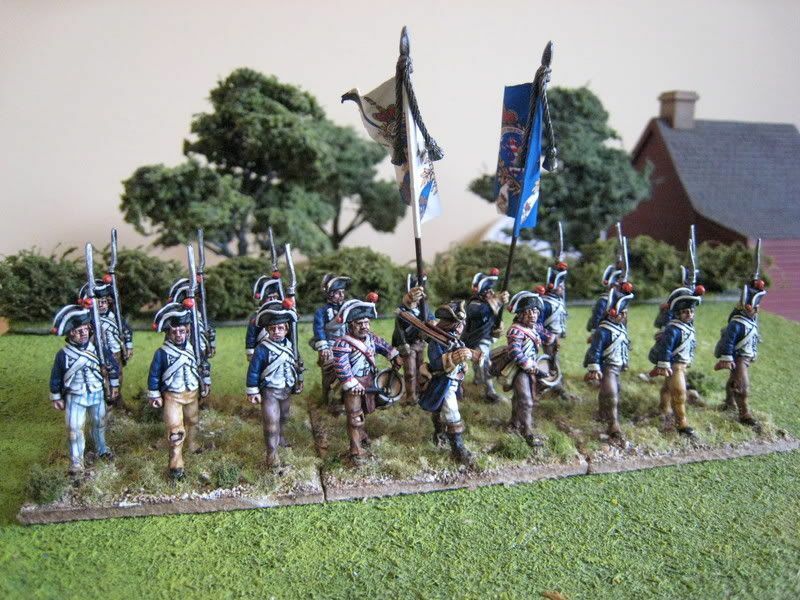 In keeping with my current aim to paint up regiments which had colourful uniforms (according to the odd deserter or two) I alighted upon the 3rd New Jersey in their 1776 uniform. This regiment is more usually known as the New Jersey Blues, on account of its uniform of blue faced red coats and blue breeches, at outfit that seems to date back to the French and Indian War. A quick perusal of the "British Grenadier!" scenario book tells me that the regiment was present at Brandywine as part of Alexander's brigade in Sullivan's division, positioned around the settlement of Birmingham. The Osprey on George Washington's army refers to deserters in 1776 wearing coats of "drab faced with blue" and "buckskin breeches". There is a Don Troiani painting of this uniform here. 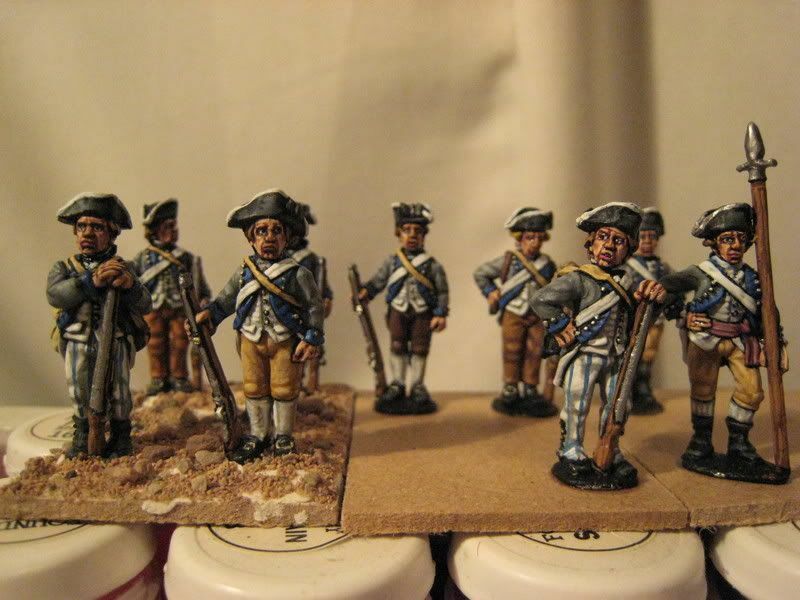 I painted most of the figures who had breeches in buff. 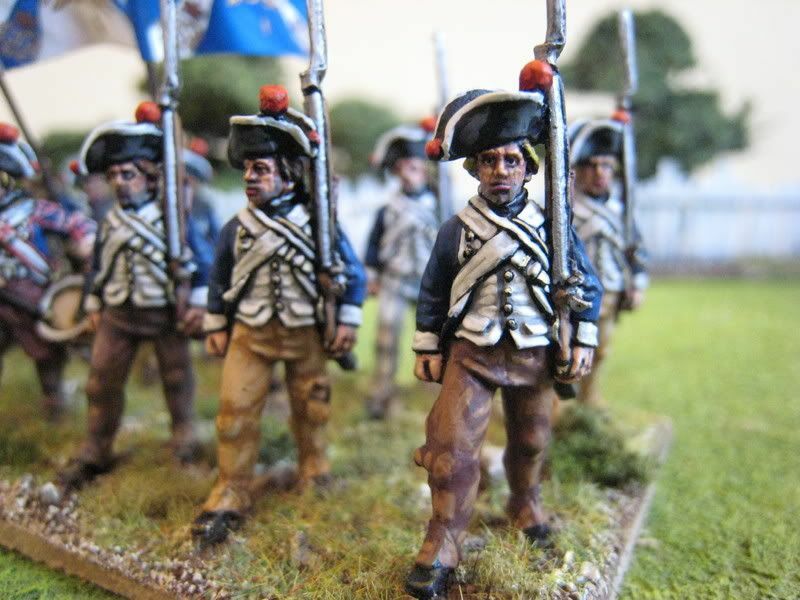 Some of the figures wear overalls and for I decided to paint all those the same colour, as if the Quartermaster had procured some ticking for those soldiers for whom there were not enough buff breeches. 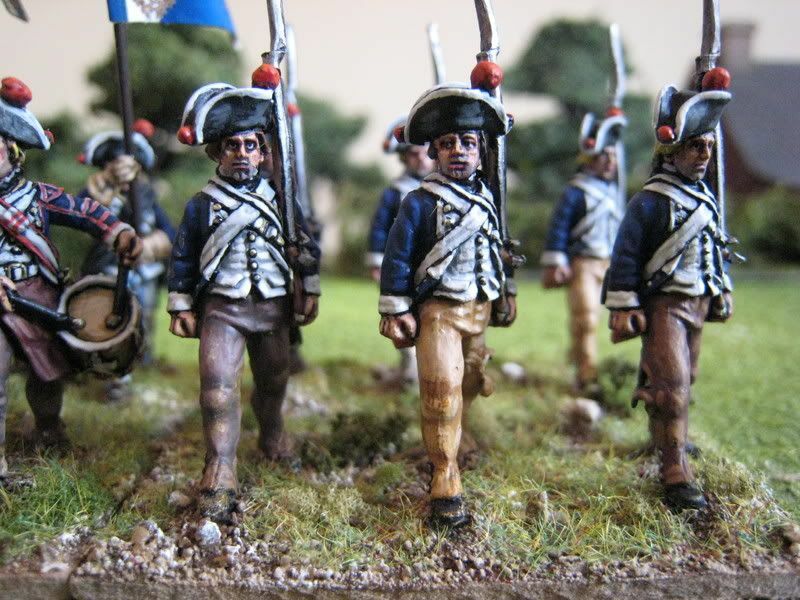 The regiment therefore is clothed with either buff breeches or ticking, so creating a more uniform appearance (one or two "new recruits" aside). This follows recent conversations I had with others who feel that too much is made of American units being dressed in an ad hoc fashion. There is documentary evidence of new coats being withheld until there were enough to clothes all the soldiers in a particular regiment, so illustrating that officers preferred to have their men dressed as uniformly as possible. 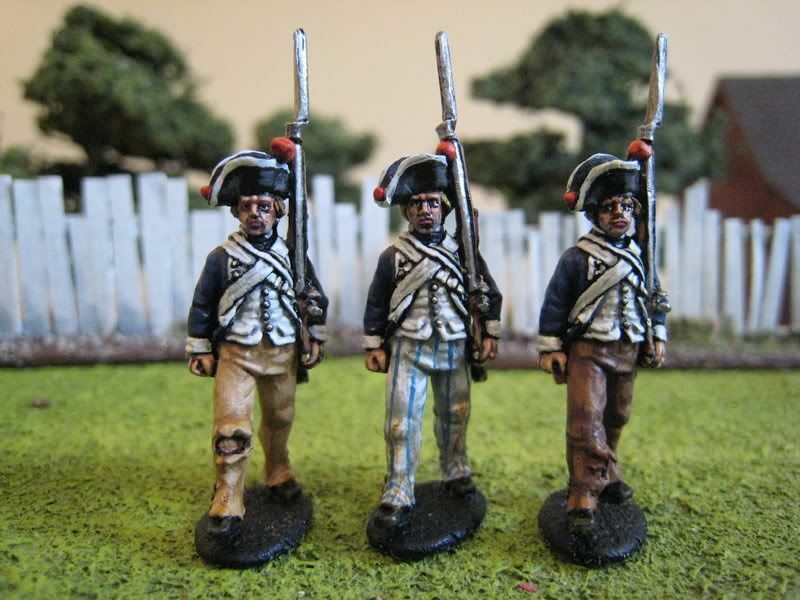 I do like these Foundry "uniformed militia" figures as they are full of character. I tried to place them so that they interreact. So for example, in the back row on the extreme right of the photos, the corporal is telling the men to his immediate right (as you look at the pic) to pipe down and get in line. 16 figures. Painted January 2008. Flags by GMB. This is the second of the Perry tumbrels that I acquired at Christmas. For variety's sake I swapped the driver with the figure from one of my two 4-wheeled ammunition wagons, so both tumbrels don't look entirely the same. I also painted the horse as a bay rather than a chestnut. I find I don't paint enough bays because chestnuts are my favourite, and so my "default" option when painting horses. Looking at my "artillery train" the other day I realised that almost all the horses are chestnuts, so I quickly repainted as bays a couple of the horses currently on my painting table, which seemed to be in the process of becoming chestnuts as well. I painted a "dun" as well, although I'm not sure it turned out all that well. These photos are the product of a marathon basing session last night. 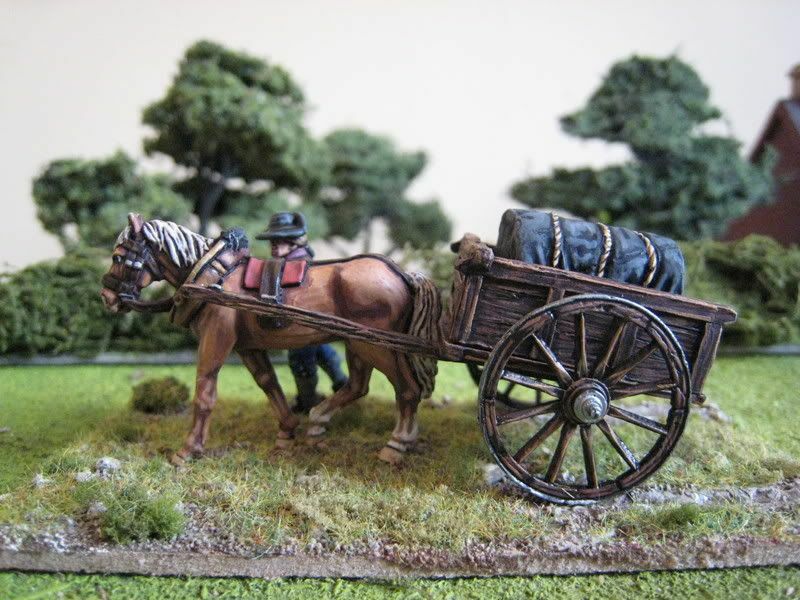 Over the next few days I'll post photos of the 3rd New Jersey, the 4-wheeled ammunition wagons and a limber. Incidentally, Henry Hyde tells me that a forthcoming issue of "Battlegames" magazine will feature an article comparing various AWI rules - sounds fun, so keep your eyes peeled. Also in the final stages of preparation is volume 4 of Touching History's terrain and model making books, which will feature the AWI, F&IW and ACW. 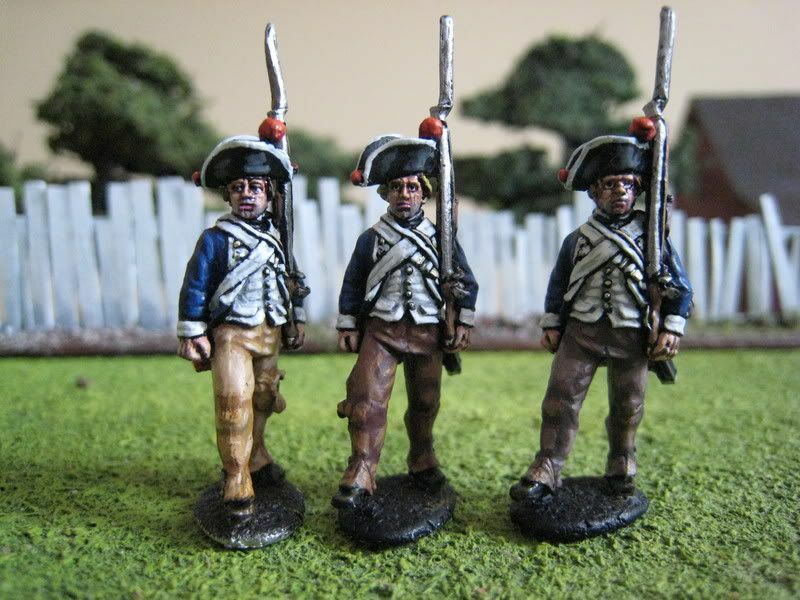 I have reached another "basing hiatus" so thought I'd just post a pic of my latest regiment, the 3rd New Jersey (in their 1776 uniform). This 16-figure regiment was finished this evening, so hopefully will be based and photographed by the middle of next week. These are Foundry "uniformed militia" figures. Also finished are a couple more pieces for my American artillery train, the first of which (a limber) should be up on the blog by Sunday evening. 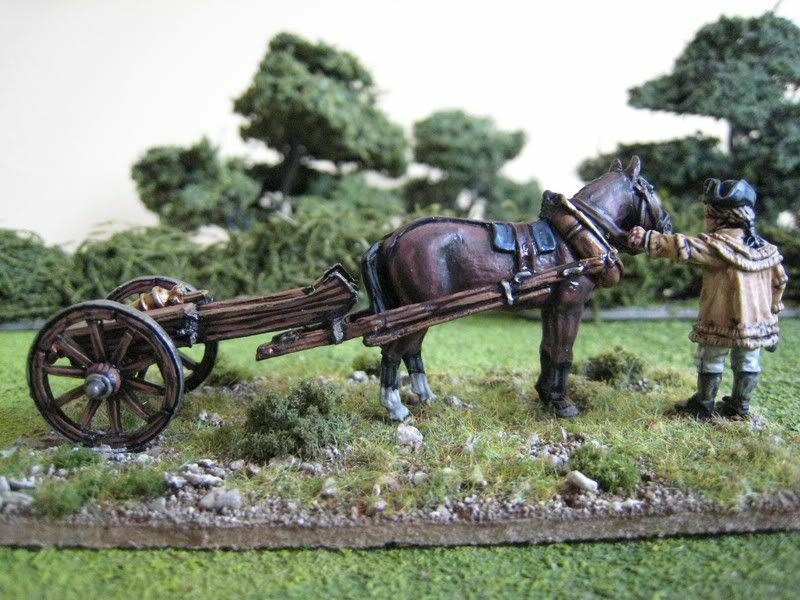 I'm going to spend the weekend working on the new Perry 2-horse wagon and then start on some more militia next week. 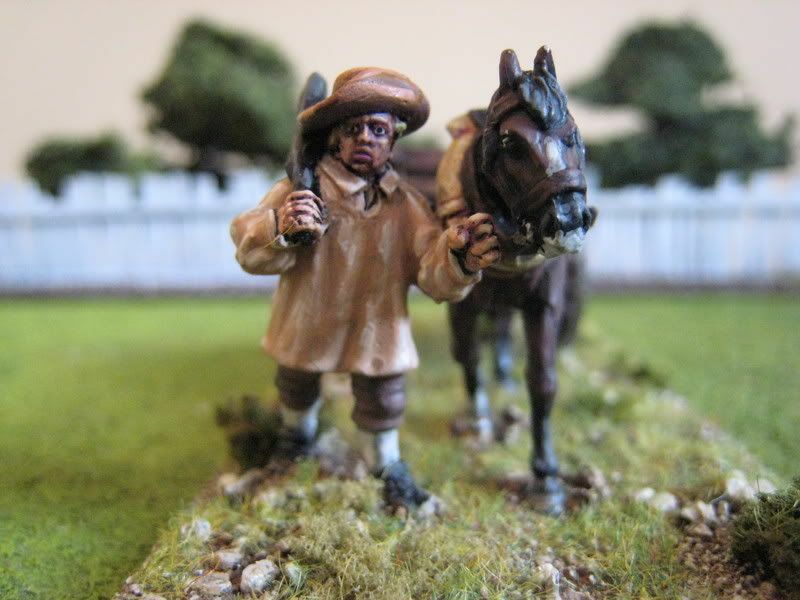 I want to clear my leadpile of Foundry militia figures prior to the release of the new Perry southern militia range (now up on their website in the "on the workbench" section). Last week I took stock of my American forces, mainly because my collection's being photographed next weekend for a guest appearance in a hobby publication (more on that in due course). 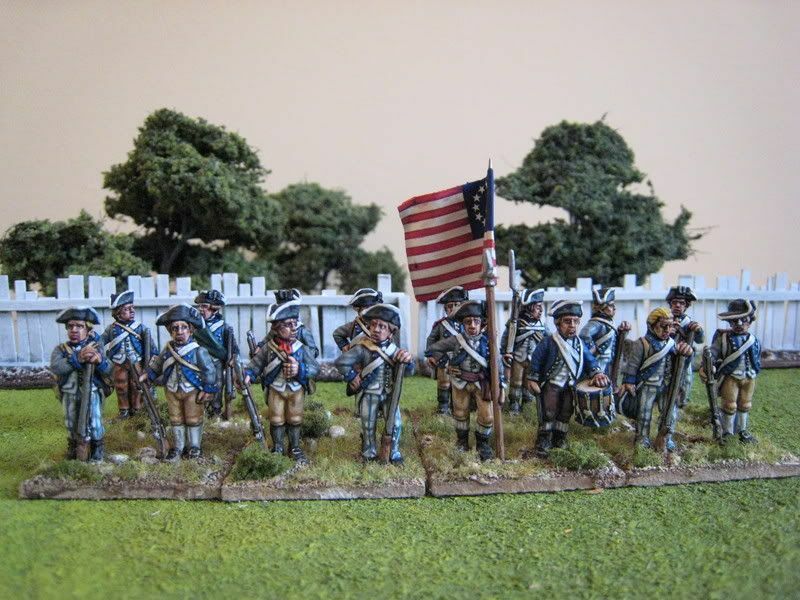 With the 3rd New Jersey I now have 24 Continental regiments and 6 of militia; those totals include 5 units of skirmishers (3 regular, 2 militia). The regulars break down into 1 regiment of 24 figures, 8 of 20 figures, 4 of 18 figures, 7 of 16 figures and 1 of 12 figures. That's not a bad little army, probably enough to do Monmouth but not Brandywine in its entirety. 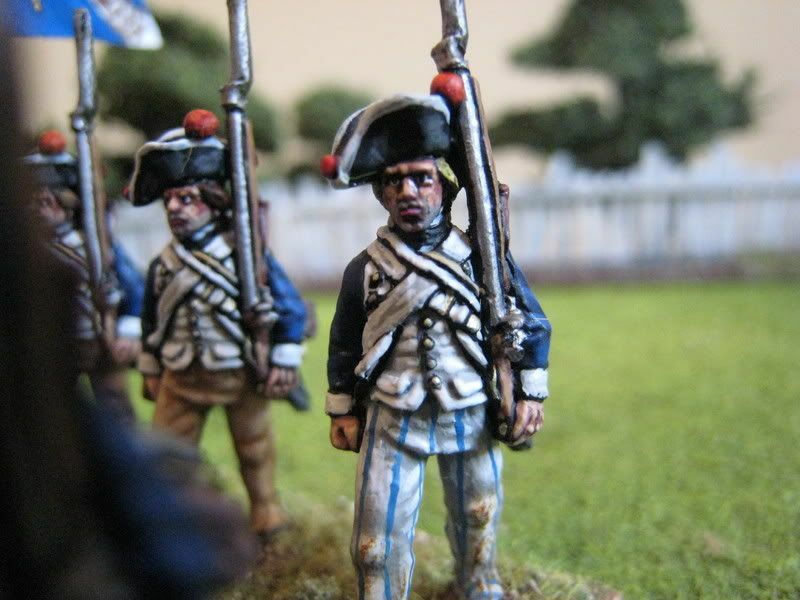 As I said a while ago, my approach with American infantry going forward is to paint up units that have colourful uniforms, provided there is sufficient historical justification for doing so, or which have interesting flags. On the list of further regiments to paint are 3rd Connecticut (brown faced red coats), 1st New Hampshire (green faced red coats), 8th Virginia (hunting shirts), Henley's Additional (scarlet faced light blue coats), 1st Pennsylvania (brown faced green coats) and perhaps some Carolinas regiments. Once those are finished I might call time on the Continental Army, subject to anything new that Perry or Eureka might come up with. Something worth noting is a new 10mm AWI range from Pendraken. These are very well sculpted figures and the range looks as if it will be pretty comprehensive. 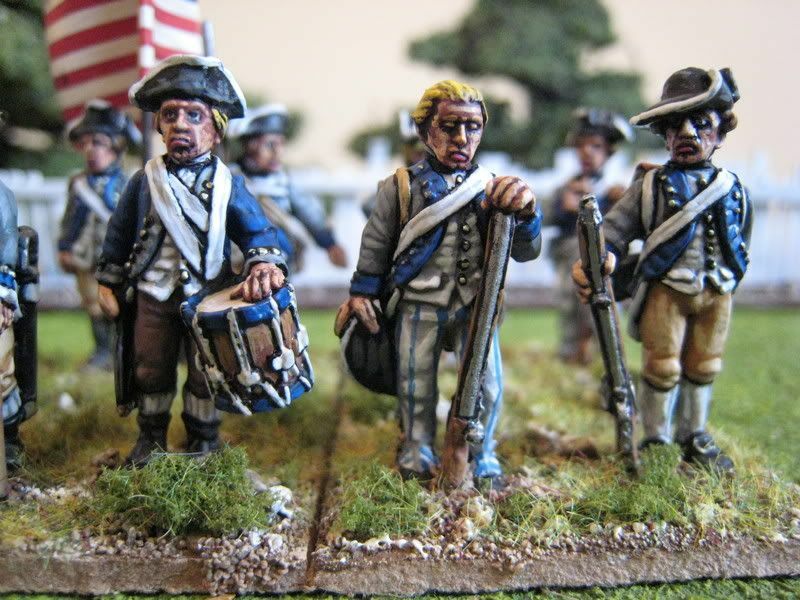 Something I have always had at the back of my mind is a demo game of a battle like Bunker Hill or Guilford Courthouse at a 1:1 ratio in 6mm or 10mm. That would be very interesting to model. Check out the Pendraken range here. The von Bose regiment has a rather unique position in the history of Hessian regiments in America. The regiment was stationed in New York in 1776-80 (until October 1778 it was called Trumbach's regiment, after it's chief at that time). In April 1780, elements of the regiment and some loyalists sallied out into New Jersey to attack the positions of Major Byles. In October 1780, the regiment embarked for Virginia and then to Charleston in order to join Cornwallis' army in the south. The Hessians did not enjoy the extreme heat and bad conditions of the south. Regimental records show that sickness was very common due to bad water and long marches in the intense heat. But the regiment nonetheless fought well. At Guilford Courthouse, the regiment performed sufficiently well for Cornwallis to say that the regiment "deserves my warmest praises for its discipline, alacrity,and courage...". The von Bose found itself in danger of being outflanked, as happened to the Guards' first battalion, but successfully repulsed Lee's Legion and helped rescue the Guards. The regiment therefore played an important part on the British victory and it's comanding officer, Major Johann Du Buy, was singled out by Cornwallis for particlar praise [yes, I know some Americans don't consider this battle to be a British victory!]. The regiment lost 11 killed and 66 wounded, out of British totals of 109 and 389. Within a month of the battle of Guilford Courthouse, Cornwallis' army had arrived at Wilmington where the entire army was re-fitted with new clothes. Each soldier was issued with two pairs of shoes (one of which was free!) as the men had been reduced to marching barefoot or fashioning cowhide slippers. The army travelled on to Yorktown, where the regiment was eventually surrendered. When I first decided to model this regiment, I wanted to recreate a unit that looked as if it had been tramping through the southern wilderness and so had a real "campaign" look about it. 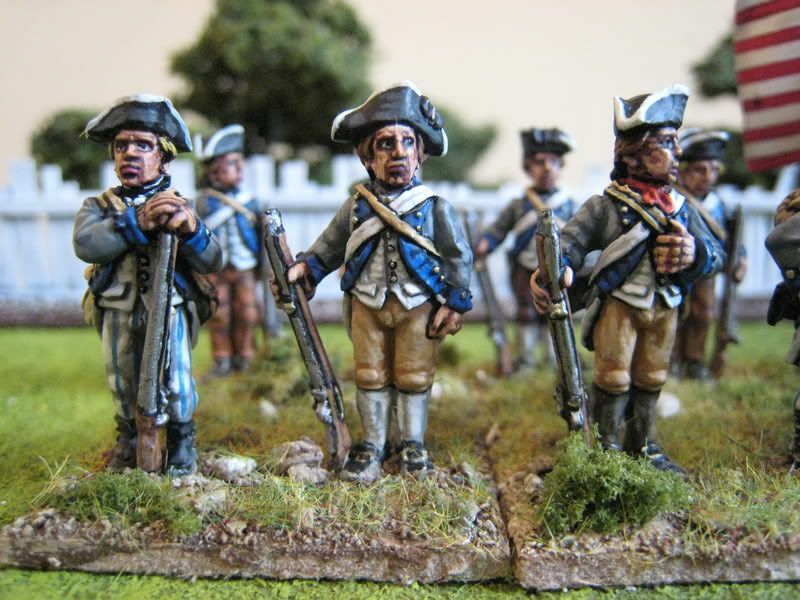 The idea of using green stuff to add some tears to the leggings and shoes came from Pat Smith's excellent work on Ferguson's Rifles (which you can see on the Perry Miniatures website). This was my first attempt at using green stuff for anything substantial and certainly the first time I've ever tried to alter a Perry sculpt. The results are perhaps a bit "ott", but I think they look ok. The drummer on the right of the command group photo has an opened-up shoe; perhaps that's why he looks so upset. I gave most of the figures "5 o'clock shadows" because given that Cornwallis didn't even stop for lunch when racing to Guilford Courthouse I don't imagine the troops had time to shave either. I usually give the officers of my Hessian regiments powdered hair. There is no historical support for that at all, it being extremely unlikely that officers in the field went to this kind of bother; but on Hessians it somehow looks right. This time I gave both officers dark brown hair and added some grey streaks on the officer in the rear rank. 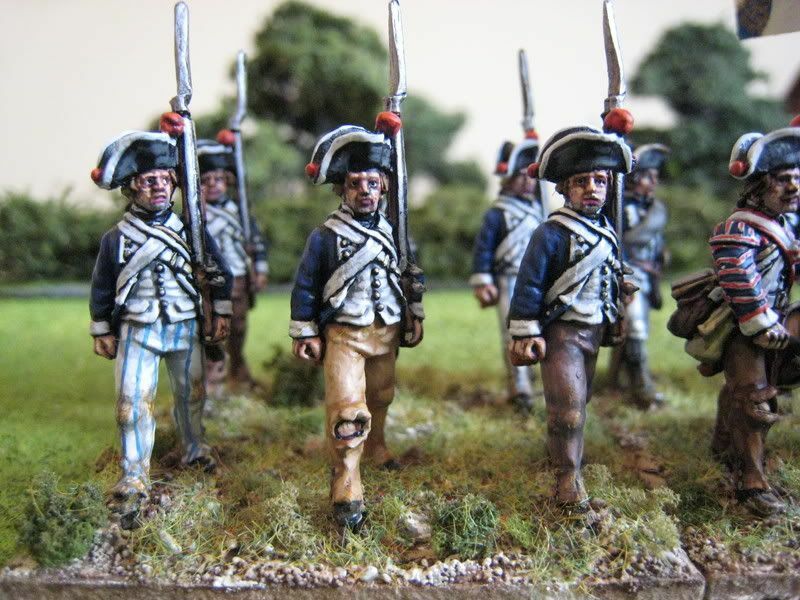 I painted the leggings in a variety of colours and gave some men blue-stripped ticking, which I thought they might have looted from somewhere. I painted these figures over the Christmas holiday and there is a step-by-step guide to how I painted the faces etc on the WD3 forum here. 18 figures. Painted December 2007. Flags by GMB. 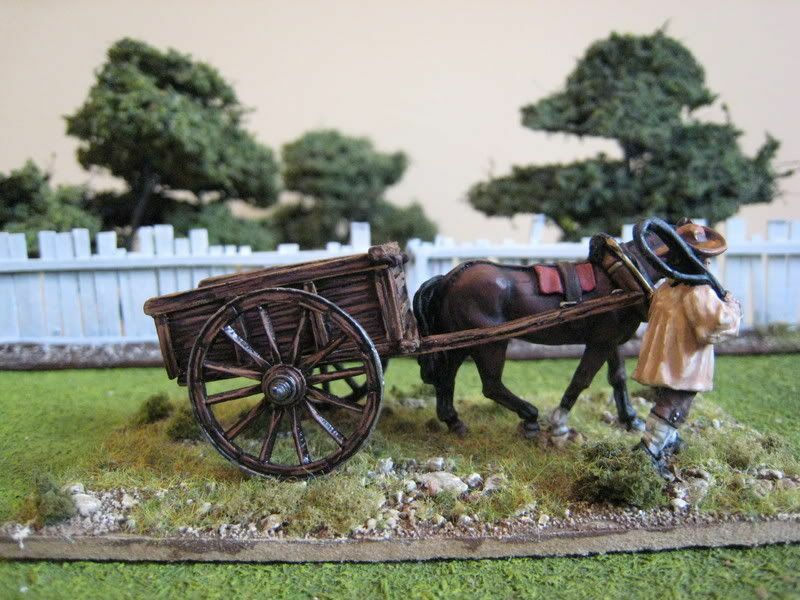 I was given two packs of the new Perry Miniatures "tumbrel" for Christmas; here is the first one (the second is finished but I want to add a different driver for variety). I willingly confess to not having heard the word before, but according to the Oxford English Dictionary a tumbrel is "a cart so constructed that the body tilts backwards to empty out the load; esp. a dung-cart." It's military meaning is "a two-wheeled covered cart which carries ammunition, tools, or sometimes money for an army" (Wellington's brother, the Governor of India, used the word in his despatches to refer to carts carrying military supplies). The word, in a different spelling, seems to date back to the 1480s. As I've said before, I am a great fan of "extras" on a wargames table and this tumbrel will appear in pretty much every game. 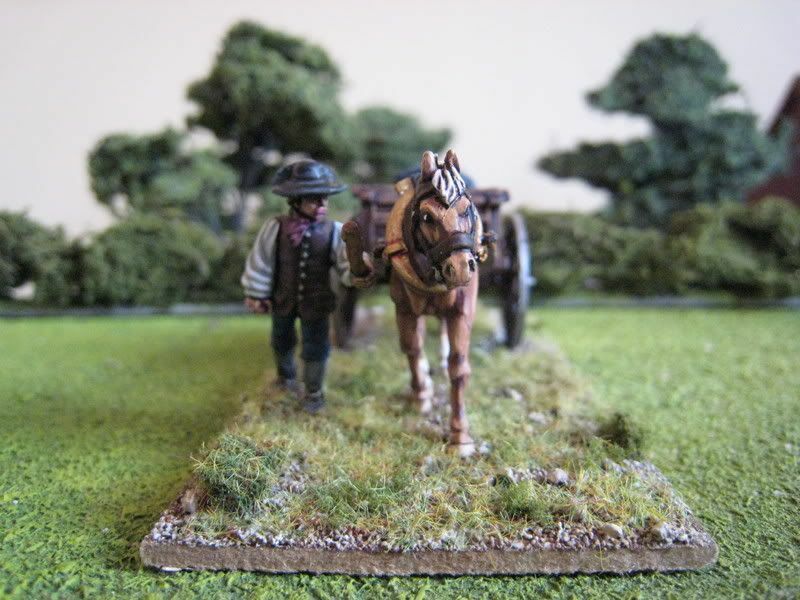 I did wonder whether I needed two of them, but the early Monmouth scenario reported below requires a substantial baggage train and the "British Grenadier" Oriskany scenario calls for 4 waggons to accompany the American column. So I decided to keep both packs and I am sure I will find a use for them. The pack comes with a tarpaulin-covered load, presumably ammunition. I have glued that in place on this tumbrel but won't do so on the second tumbrel so I can add other stuff like barrels. 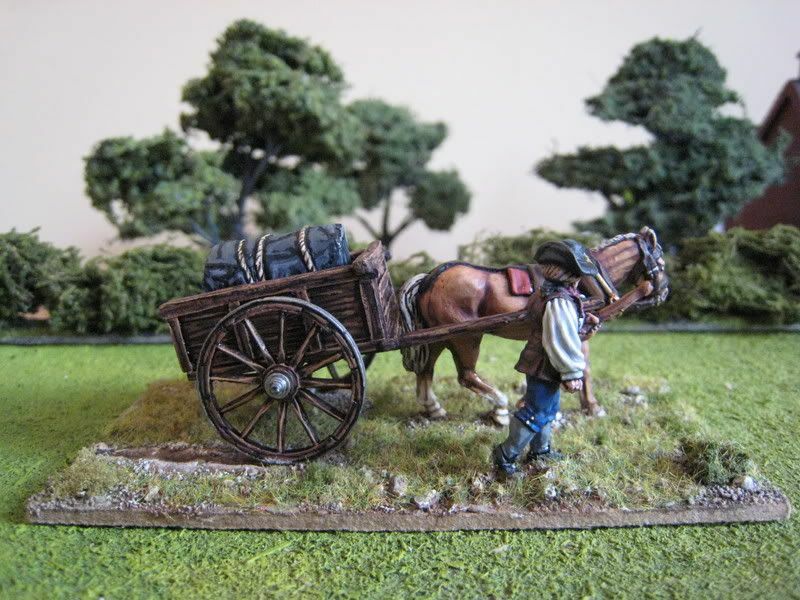 I also have a twinkle of an idea of a "rescue Major Andre" skirmish game, although the back of the cart is not quite large enough to fit a figure based on a penny (there is a figure in the Foundry pirates range of a gentlemen with his hands tied behind his back, who would be very well for a captured Andre). 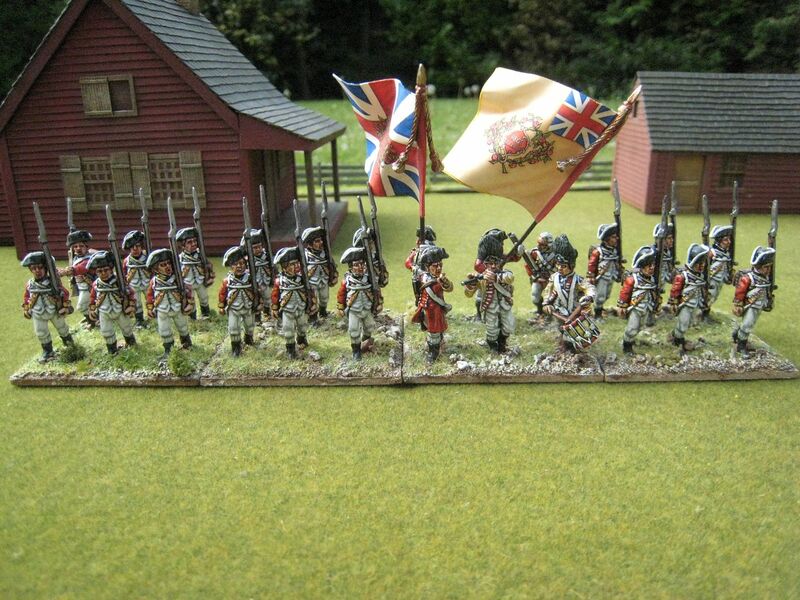 This is the second regiment that Nigel B asked me post about. The 49th Foot arrived in Boston in 1775 and only remained in America for 3 years before departing to protect the West Indies from French and Spanish attack. 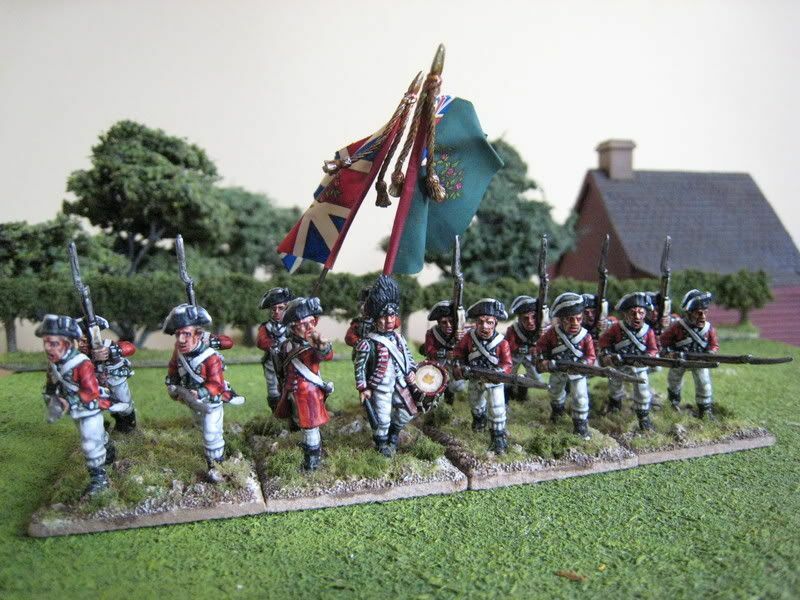 The regiment had green facings but, like the 38th Foot, had bastion lace, which is very difficult (if not impossible) to recreate on Foundry figures. 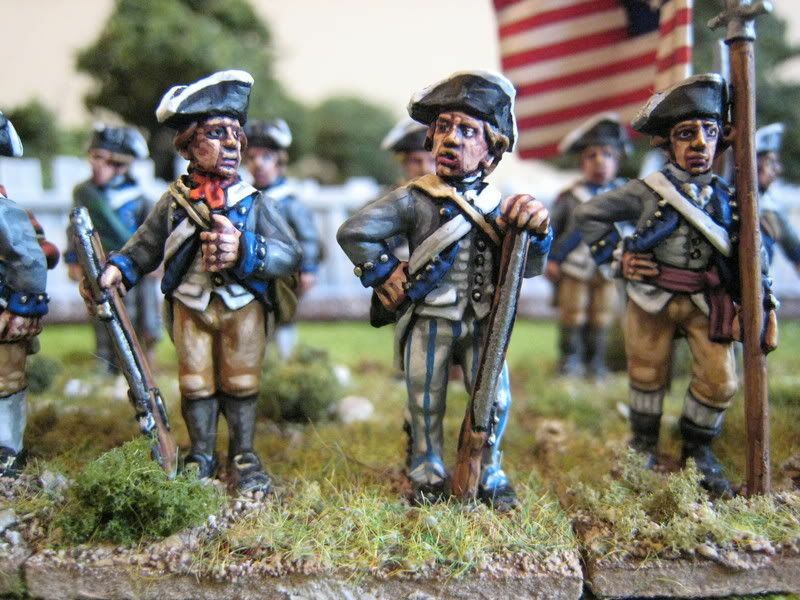 In "British Grenadier" scenarios, the 49th needs 16 figures for White Plains (October 1776) and Brandywine, at which it fought in Vaughan's brigade in Knyphausen's division. I modelled the regiment in 1768 warrant dress for three reasons. First, I had bought a truck load of Foundry figures and didn't have much choice. 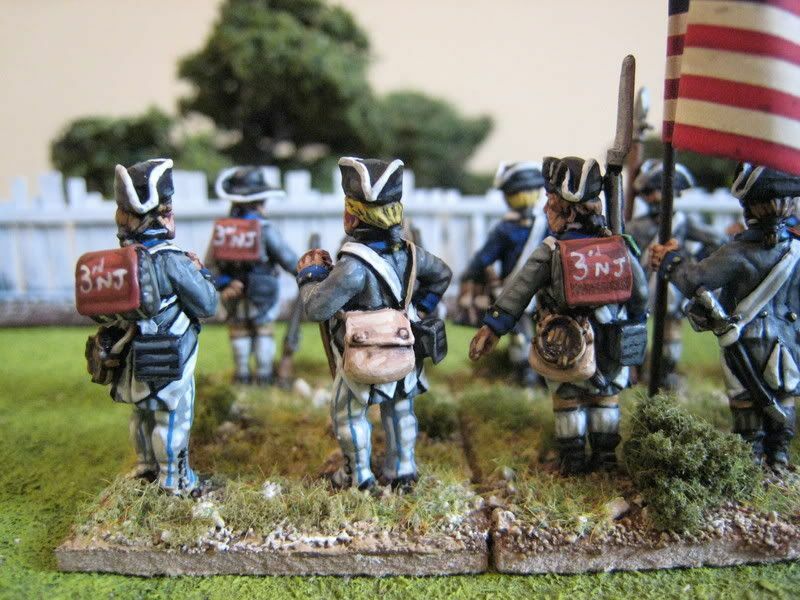 Secondly, I decided that for White Plains it was probably reasonably authentic to keep the troops in white-laced tricornes and un-shortened coats. 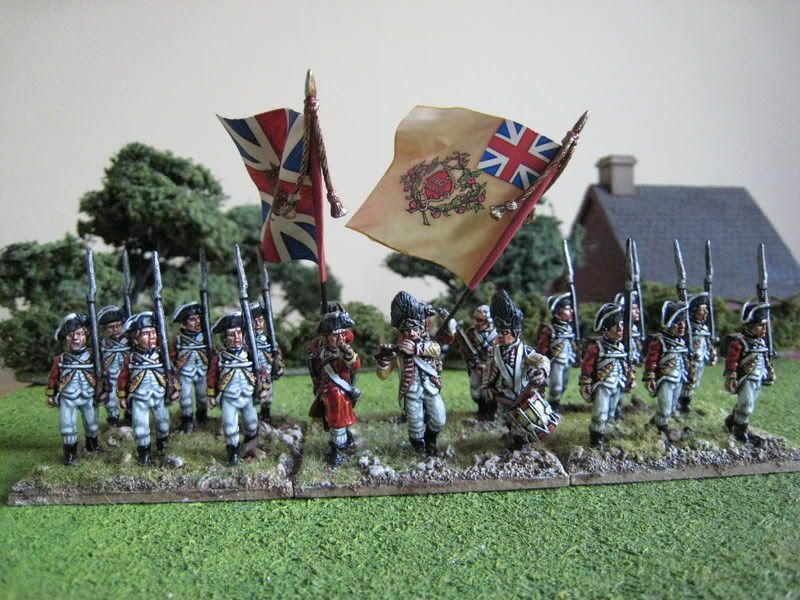 As a consequence, all the British regiments I have painted specifically for White Plains (the 28th and 35th, as well as the 49th) are in "full dress". 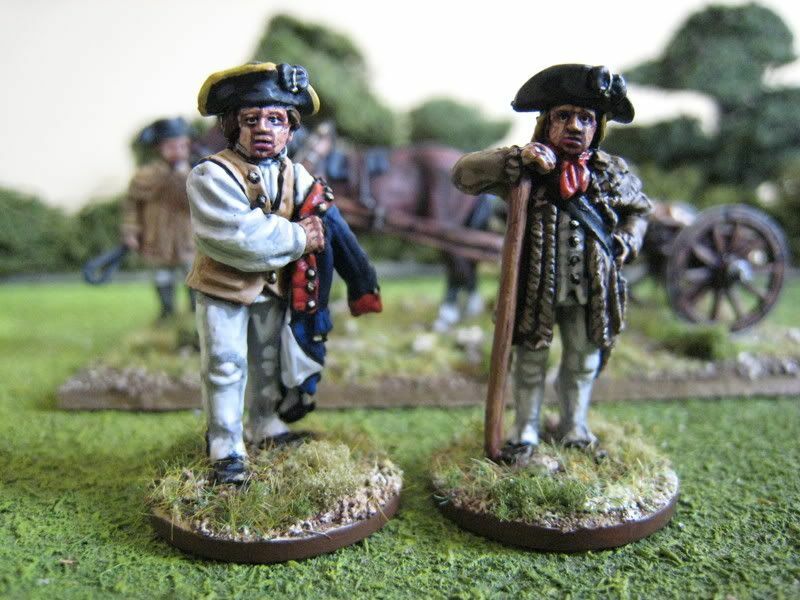 Thirdly, I needed a green faced regiment to provide a couple of bases to attach to the 18-figure 52nd Foot for the Bunker Hill scenario. That battle, which is contained in the BG rulebook, requires a 24 figure unit to be formed by the 52nd and 5th regiments. My 5th are in Perry campaign dress and so not suitable for the 1775 battles. 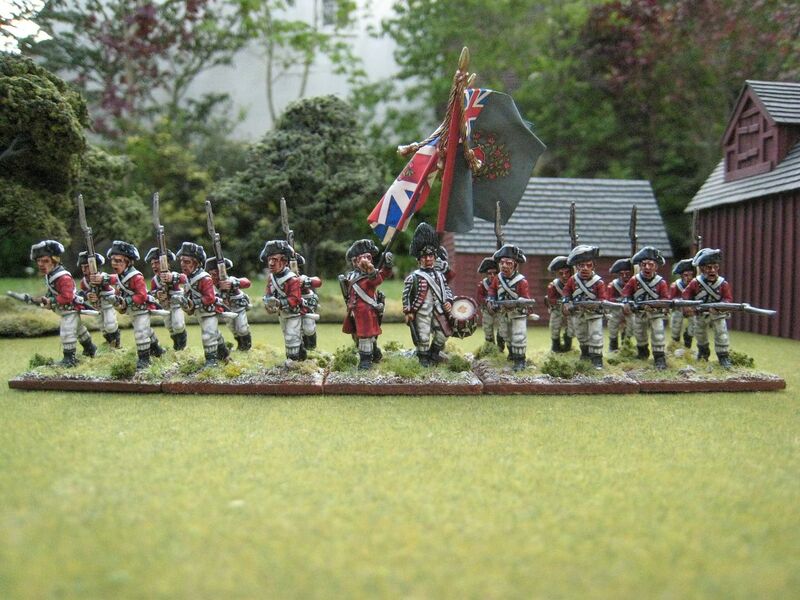 I needed a regiment with green facings which I could model in charging poses, to fit alongside the 52nd which consists of charging Foundry figures, and the 49th fitted the bill. 16 figures. Painted April 2005. Flags by GMB. UPDATE: a further 4 figures were added in 2016 to take the unit up to 20 figures for the Dorchester scenario (as per the photo above). A reader emailed me the other day to ask if I could post pictures of the balance of Vaughan's brigade at Brandywine. The 4th and 23rd Foot (Feet?) have already been posted, but not the 38th and 49th. 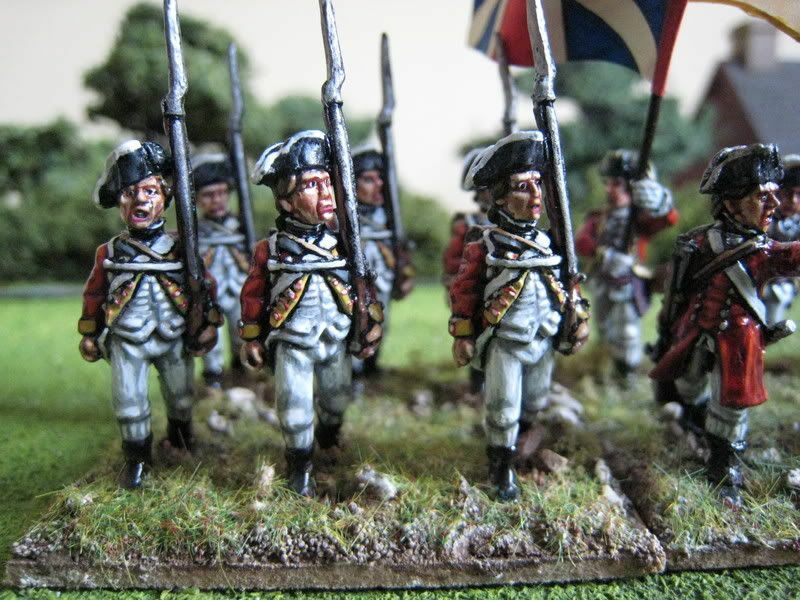 I'm happy to oblige, although these are units that I painted years ago and are a little bit ropey. Here is the 38th and I shall post pics of the 49th tomorrow. The von Bose musketeers and an artillery wagon will be posted shortly thereafter. The 38th Foot arrived at Boston in July 1774. The regiment remained in the Americas for the duration of the war and fought at Bunker Hill, Long Island, Brandywine, Germantown and Monmouth. It was in Pigott's brigade at Bunker Hill and by Brandywine was part of Vaughan's brigade. The regiment had yellow facings and bastion lace. It later became the South Staffordshire Regiment. I painted this regiment predominantly for Bunker Hill, which is why it is composed of Foundry figures in standard 1768 Warrant "full dress". The "British Grenadier!" scenario requires 18 figures, so I built up the unit of bases of 6 figures. Only 16 figures are required for the Brandywine scenario. 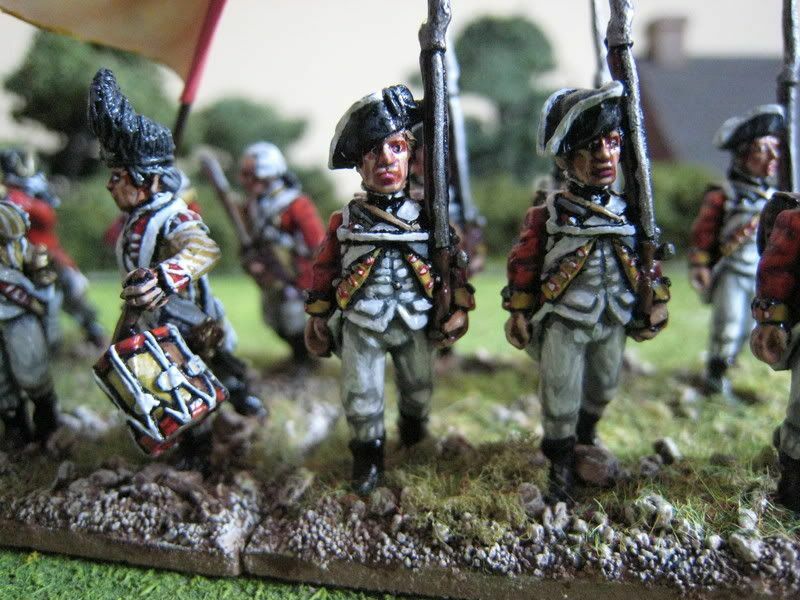 The regiment had probably moved into campaign dress by the time of Brandywine, but I'm not going to bother painting another version of it and, in any event, there's something rather stirring about Brits advancing in tricornes and full kit. 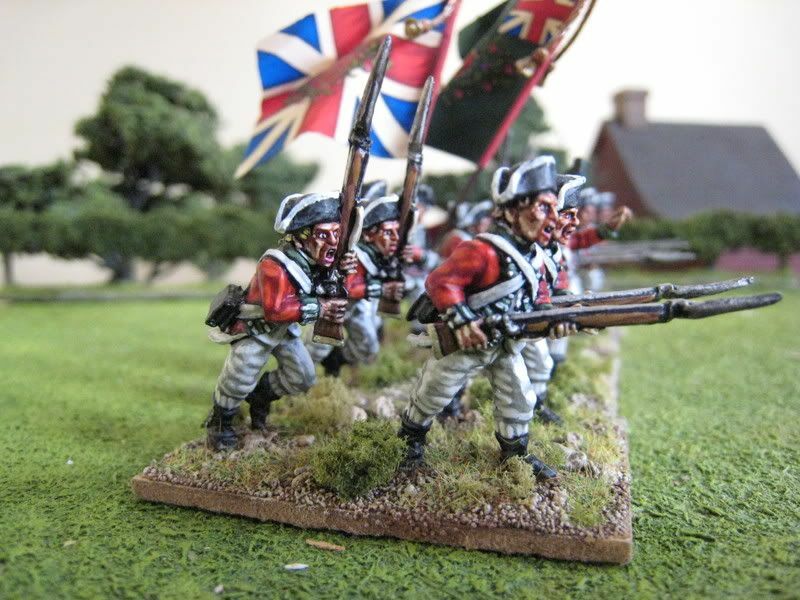 I think this was the second or third British regiment I ever painted and there are mistakes. For some reason I painted the lace on the officers' hats gold, which is wrong as the regiment's metal colour is silver. The lace is clearly not bastion shape, but the lace on Foundry/Perry figures is sculpted on and only rather heavy filing could turn the lace into bastion loops; not worth the effort really. 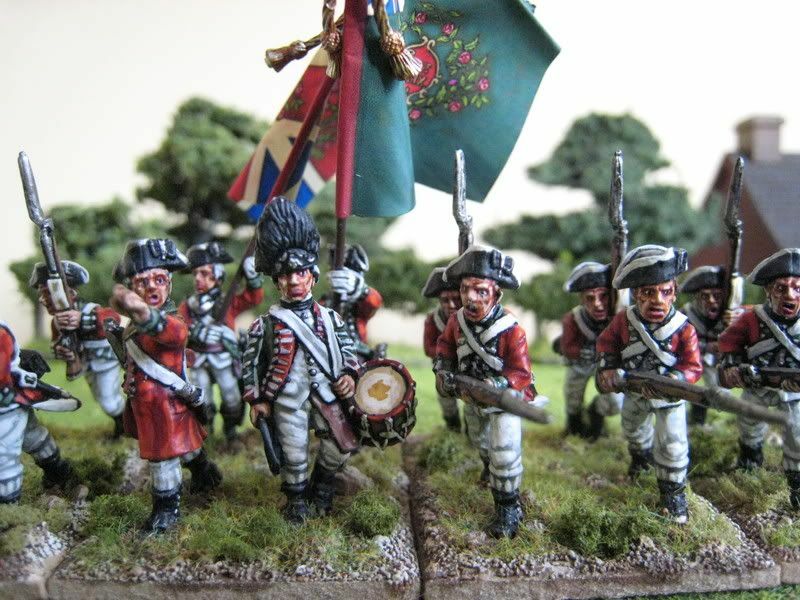 I'm sure there are other mistakes; if anyone's reading this blog for the first time, don't start painting British figures until you have read and digested the Royal Warrant of 1768 (which I had failed to do). These figures' faces also heavily rely on the Foundry 3-tone flesh pallette, which I now hate and which I dropped in favour of a mixture of GW, Coat d'Arms and Foundry paints. (My post on the von Bose musketeers will have a link to a painting "step-by-step" that I wrote on the WD3 forum). 18 figures. Painted some time in 2004. Flags by GMB. UPDATE: a further 6 figures were added in 2016 to take the unit up to 24 figures for the Springfield scenario (as per the photo above). My humble blog is one year old today. Many thanks to everyone who has posted comments and contacted me offline. One of the most rewarding aspects of blogging in this hobby is the people one comes across, and I am delighted that there are now gamers in various parts of the world who I can meet up with if I'm ever nearby. Incidentally, I will shortly be closing my AOL email account and my new address is with Sky (unfortunately one of those rather silly-sounding joint addresses): shelleyandgiles1@sky.com. I thought this would be a good opportunity to take stock of my AWI collection and plan out what lies ahead. As mentioned before, I have been painted AWI since early 2003, pretty much non-stop since the beginning of 2004. 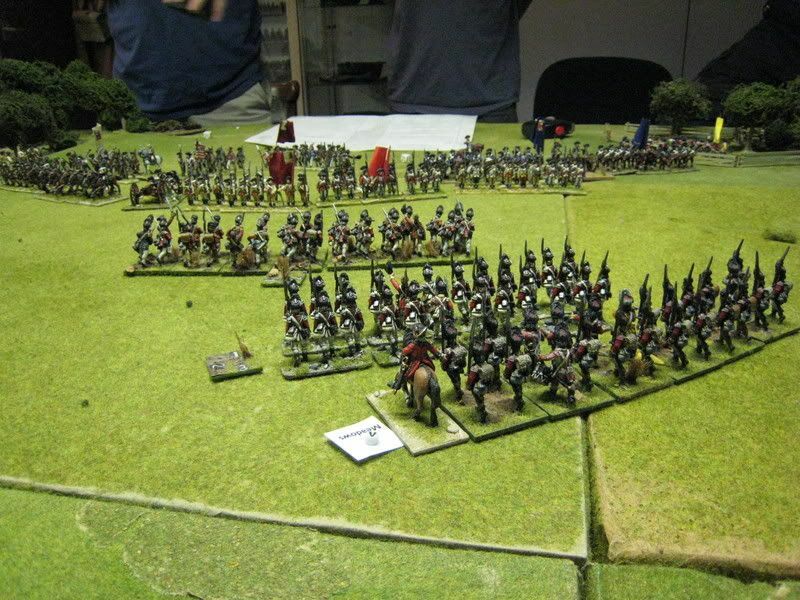 There have been one or two detours, notably my 1815 Napoleonics in the first quarter of last year, but the AWI has been my focus for the past four years or so and I can't say that I have ever been bored. The period is so rich in variety. As well as being a classic period of military activity, the second half of the 18th century was a time of great music and art; the past few years have coincided with large exhibitions in London of paintings by Reynolds, Romney, Gainsborough and others and I have enjoyed looking at the wider circumstances of what was a very "social" conflict. 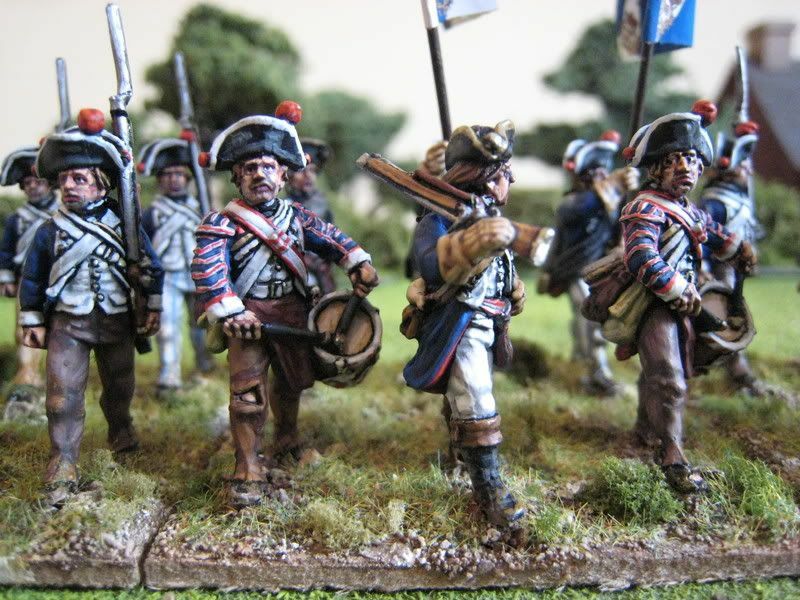 Much of the wargaming interest is of course down to the beautiful figures that Perry Miniatures release, which alongside those from Eureka, Conquest, Foundry and others mean that 25mm AWI is now one of the best served periods in wargaming. In the meantime I have 8 American and 6 British regiments in the leadpile, which will keep me going for several months. So I expect to be painting AWI for at least one more year and probably another two, perhaps longer. One advantage of being a painter first and a gamer second is that I'm not always looking at what needs to be painted for the next game and I can concentrate exclusively on one period until I'm satisfied that I'm finished. Happily, I can't see myself becoming bored of this period for a good while yet. I hope at the weekend to post pictures of the Von Bose musketeers, converted into slightly tattered campaign dress. A couple of pre-basing shots are shown above. I have also just finished one of the new "tumbrells", which again should be posted early next week. On the Sunday after Christmas I made a visit to Perry Miniatures HQ in Nottingham in the company of Eclaireur, author of the "British Grenadier!" 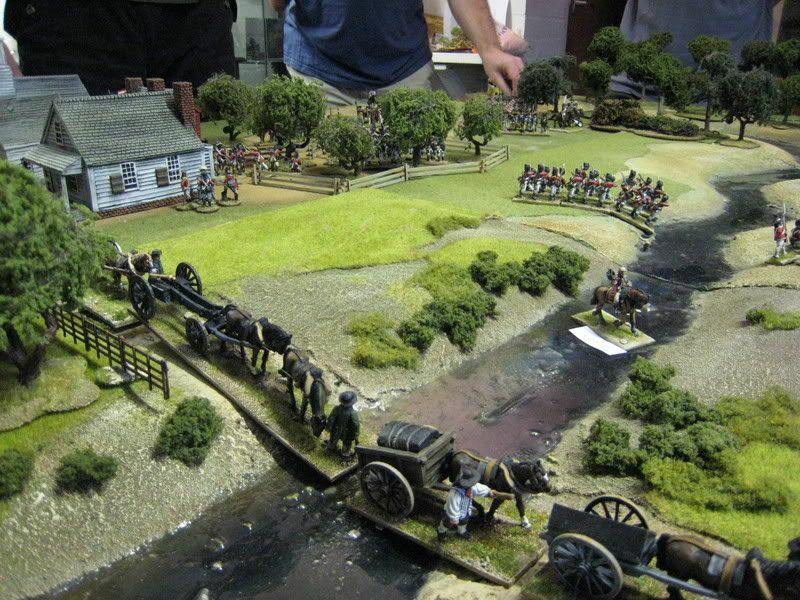 rules, to refight the early stages of the Battle of Monmouth on the Perries' vast table. Here are some photos together with a short summary of what happened. Alan and Michael Perry played the Americans, whilst their mate Chris and I started off the Brits. EC joined in later as the Hessian commander, Von Kospoth, once the British reinforcements arrived. Most of the figures belong to the twins, with a few from Eclaireur's collection and a couple from mine (which I bought along just so I could say they'd fought on the Perries' table). Monmouth was one of the largest battles of the AWI and falls into 2 BG scenarios - the early stages, which are essentially a surprise attack by the Americans under General Charles Lee on the British baggage train and rearguard, and the later stages in which the returning British main force attacks headlong into the Yanks after Lee has suffered a severe lack of nerve and Washington takes personal charge to restore the situation. 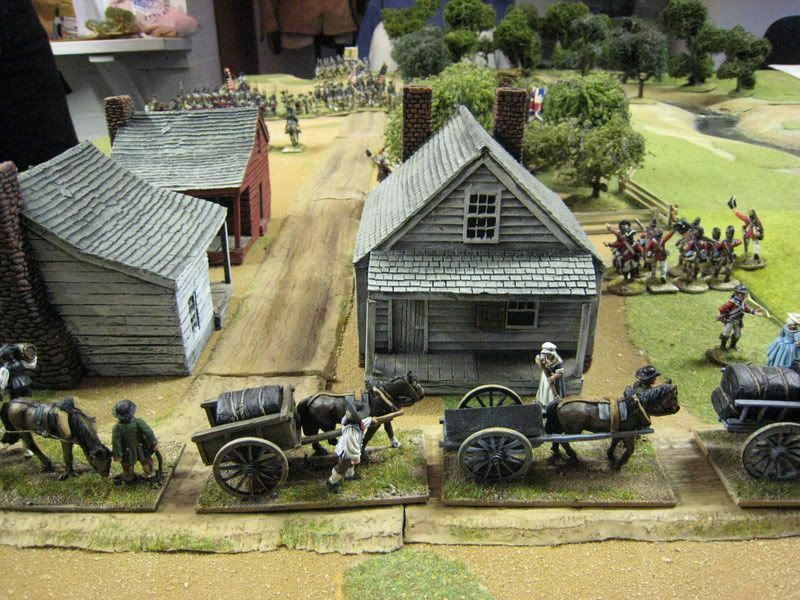 So the immediate objective of this "early stages" scenario was for the British to hold off the Americans long enough to save the baggage train, but the Britis are also seeking to hammer the Yanks once their reinforcements arrive. It is an "encounter" scenario, with reinforcements arriving for both sides at various stages in the battle. The British are on the backfoot until the 5th/6th turns, by which stage their reinforcements begin to arrive and the tables can be turned if the British attack aggressively and manage to push the Americans back. The scenario was developed by Ronan the Librarian/Supercilius Maximus and appears in the second BG scenario book, which will shortly be published by Caliver in the UK. The scenario contains various optional special rules which are designed to replicate the conditions on the day, such as movement and casualty rules to simulate the effects of the extreme heat. 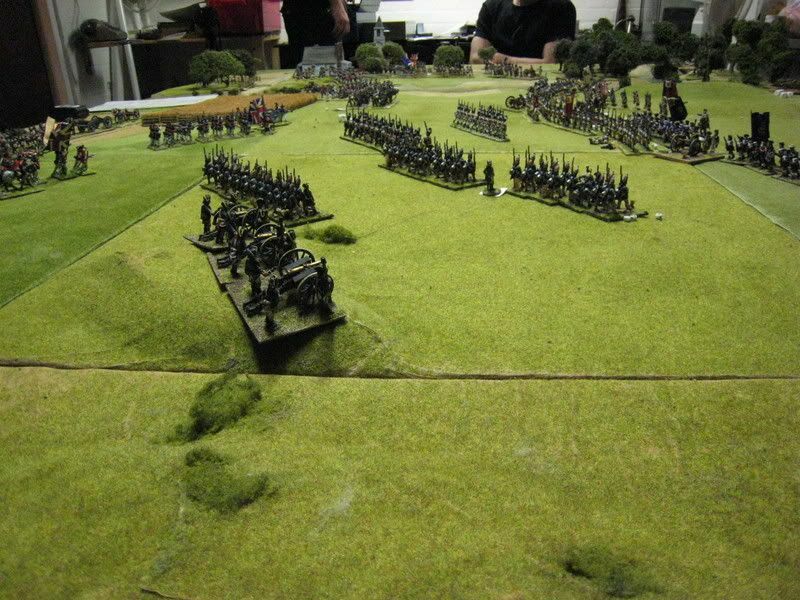 Here are the opening positions, with the baggage train screened by two battalions of light infantry, the loyalist Queen's Ranger and the British 16th light dragoons (both mounted and dismounted), but outnumbered by two American brigades which have suddenly appeared at the edge of the table. The light infantry deployed to hold up the Yanks as the baggage train hurried as fast as it could towards the other side of the table. As it happened, the Perries managed to tie these two units up with various impressive looking threats which never materialised, so the two light infantry battalions were not as effective as they should have been. What I should have done was swung the light infantry up against the Americans who were advancing on Monmouth and thrown the cavalry out to deter any flanking movement by those American units that were seeking to outflank the position. 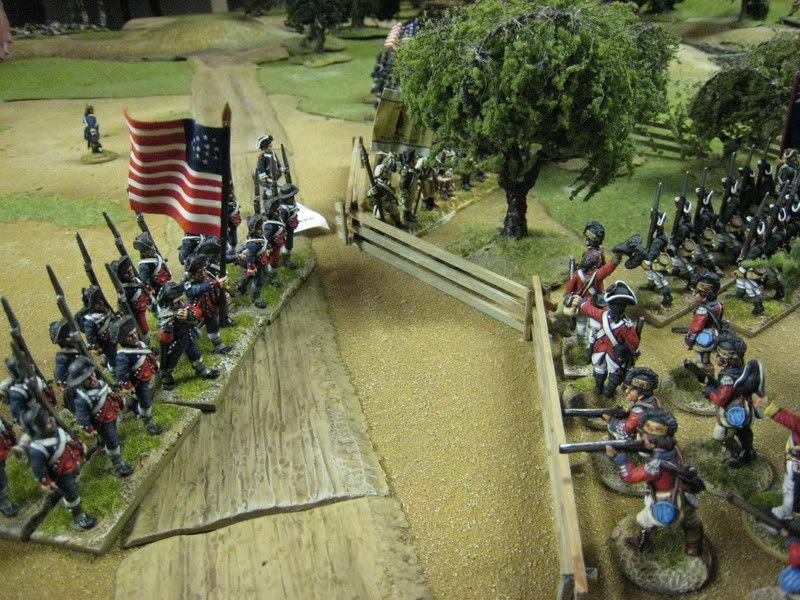 Eventually the British reinforcements arrived just as more American brigades were arriving on the table. 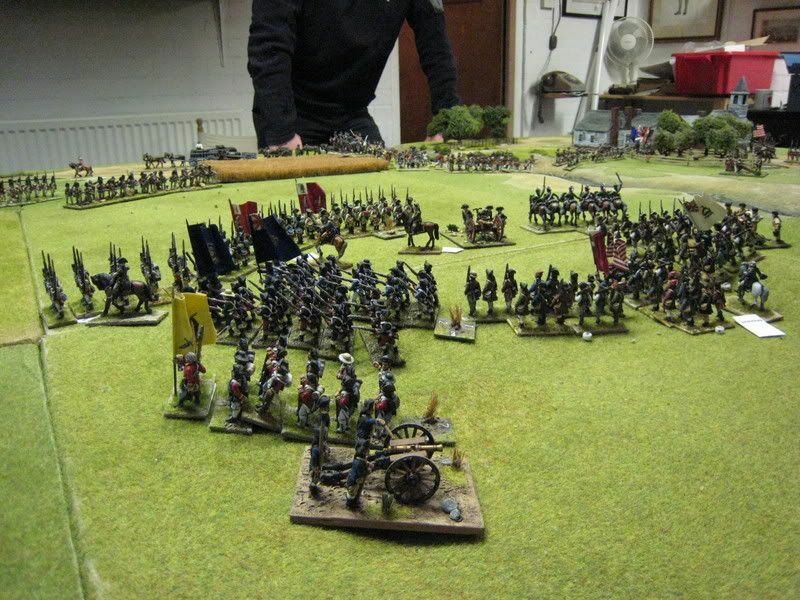 Whilst the British left was still weak, with the Americans now reformed and coming back for another go at the orchard, I threw the grenadiers brigade straight into the attack, with EC doing the same with von Kospoth's Hessian grenadiers brigade. Unfortunately, I failed to co-ordinate the grenadiers' attack properly (not helped by some poor dice rolling which quickly brought them up to 3 Disruption Points quite quickly). The lead unit found itself exposed and received murderous fire - it failed a morale check and retreated all the way back to the baggage, now safely within British lines. I can perhaps take some comfort in the fact that Clinton when ordering the grenadiers into the attack didn't seem to care much for co-ordination either: he is reported as having shouted "Charge, grenadiers; never heed forming!" (a remark which caused an incensed grenadier officer in the 45th Foot to describe Clinton as behaving "like a Newmarket jockey"). 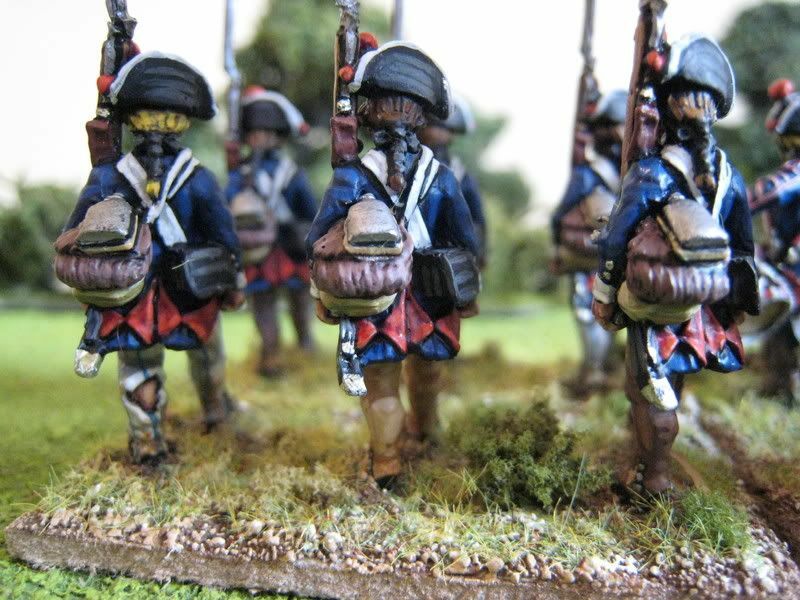 EC's Hessians fared better with their firing, and for a moment it looked like these German auxiliaries might carry the day. 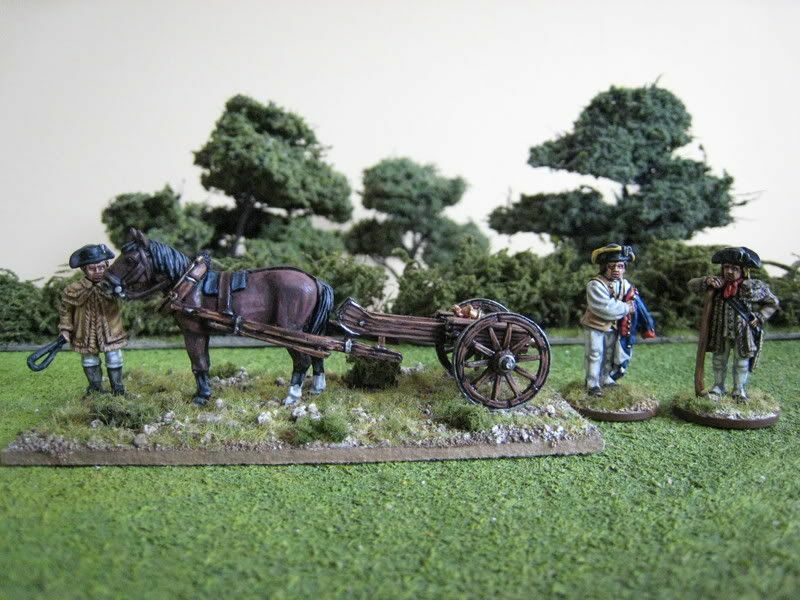 By this point the British had also finally brought up some much needed artillery (most of the game was fought with the Brits having only one 3-pounder, as opposed to several batteries of American guns). The battle for Monmouth town had now resumed, with the Americans doing a bit better than the first time and slowly forcing the Loyalists back. I had suggested a tactical withdrawal to tighten up the British line, but Chris and EC (quite rightly) felt that as Clinton was now on the offensive the Brits should hold their ground; if grenadiers were routing on the right then honour demanded no thought of abandoning the left. 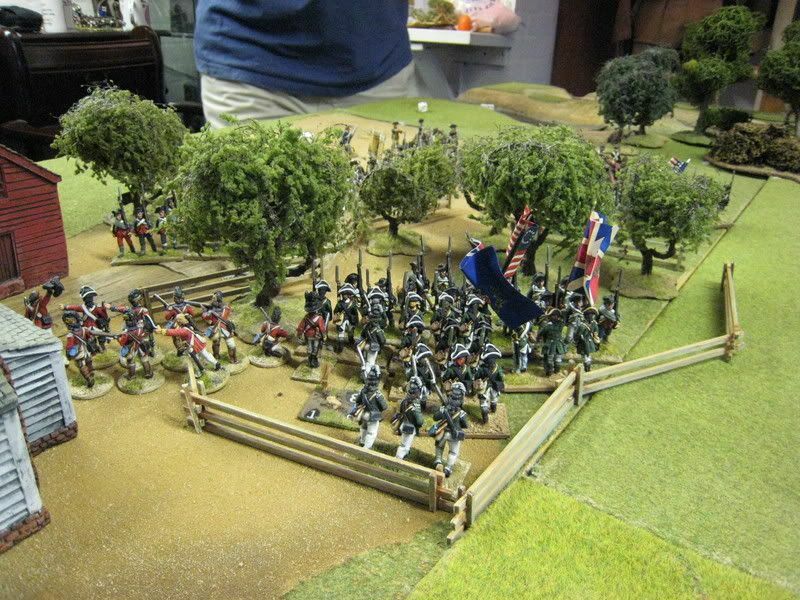 Here a skirmish line of dismounted light dragoons attempt to hold back Durkee's brigade. Initial rolls on the ensuing mellee suggested that the Americans might take the orchard, but at this point time was called (after about 5 hours' play). 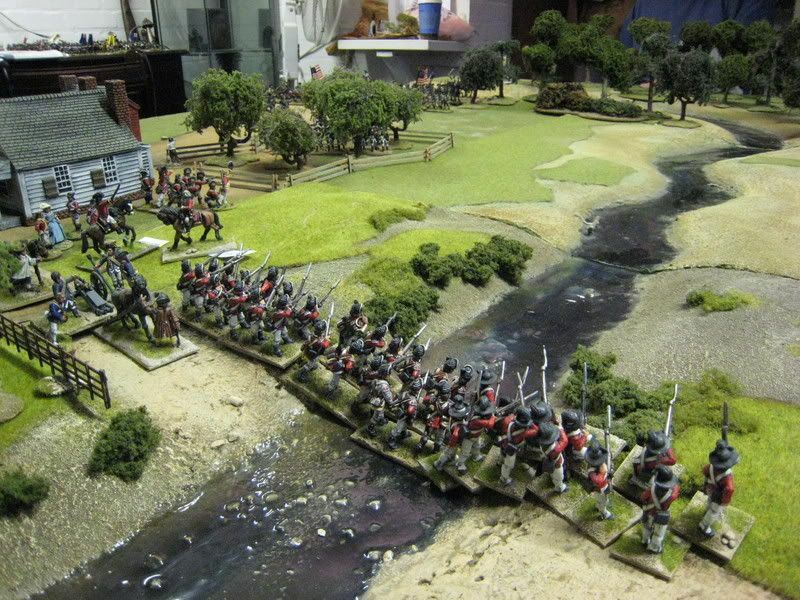 The Brits had saved the baggage train but failed to break through the American lines on the right. A couple of British regiments had taken heavy casualties, notably the grenadiers and light infantry, whilst the American losses seemed pretty light. So probably a "tactical scenario win" for the Brits but a "strategic battle win" for the Americans; or rather that's what the battle looked like at this point, but of course there was much more of it left to go. "British Grenadier!" produces a very tightly contested game, in which luck plays an important part as well as generalship. As always, careful command and control was vital - the British reinforcements had no orders when they arrived and I realised that Clinton, the C-in-C was busy trying to assist rallying off DPs on the British left when he was more urgently needed to hand out orders on the extreme right. I then failed to keep the grenadier battalions in column whilst advancing towards the American lines,which would have reduced the number of DPs they accumulated. By adopting a funny echelon formation I also allowed the Americans to rout the lead battalion and the brigade was lucky to survive the ensuing morale test. 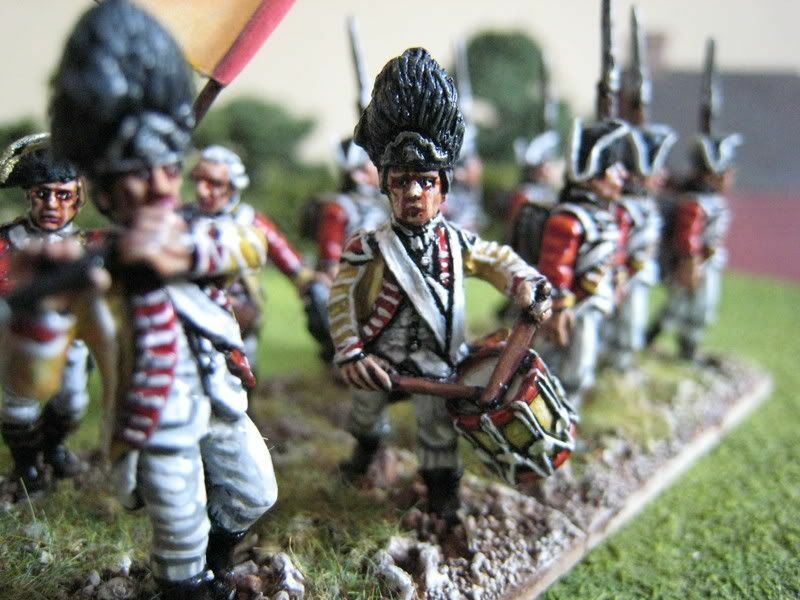 But then on the day the grenadiers took a pasting, and the mechanics of "British Grenadier!" tend to reproduce historically accurate results unless you think long and hard about what you want to happen and plan carefully. That said, the Americans did much better under the command of the Perries than they did under Charles Lee. It was a highly enjoyable day. Many thanks to Alan and Mike for their hospitality and to Chris for gamely putting up with my crappy dice throws (and for picking up the rules very quickly).